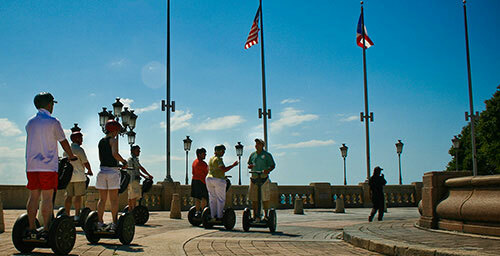 Experience the beauty and history of San Juan from an exclusive viewpoint, on a Segway Personal Transporter. A quick and efficient course on riding a Segway PT will prepare you for the experience of a lifetime. Your guide will then take you on an in-depth 2 hour tour of up to 28 landmarks in this spectacular, historic city. You'll travel exclusive routes along the Wall Walk and into the San Felipe Del Morro Glacis, providing an intimate look at this beautiful city and it's culture. 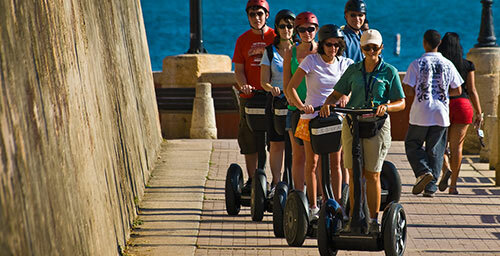 After familiarizing yourself with the Segway PT, our guides will open up the city of San Juan to you, taking in up to 14 important landmarks along the Princess Promenade and Wall Walk, up to the Gate of San Juan. The History and scenery will amaze you at every turn. Once you have immersed yourself in San Juan's charm and mystery, you'll want to experience more. This unique experience will take you on an adventure around Puerto Rico’s capital city San Juan. Known as “The Walled City” San Juan is the oldest city still inhabited under the American flag. Founded in 1521 by the Spanish crown, San Juan preserves intact 500 years of colonial history waiting for you to glide it.